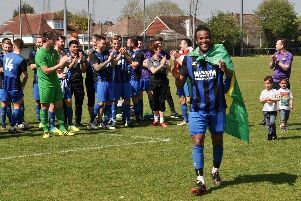 SOUTHWICK Football Club boss John Kilgarriff looked ahead to Saturday’s Sussex Intermediate Cup semi-final at Three Bridges’ under-21 team and declared: “It’s going to be a tough test”. Wickers go into the game in excellent form, with five wins and a draw from their last six County League Division 3 matches. They have also recorded three successive victories in all competitions but, despite that run, Kilgarriff knows his side will have their work cut out if they are to reach the final. He said: “Three Bridges’ under-21 side are going to be really strong and we will need to be at our best to beat them. “We will be missing a couple of players for the game but that gives other squad members a chance to come in and make a name for themselves. “If we manage to come through this match, we know that a cup final awaits, so all of the boys will be up for it. “I have been so impressed with the side all season and it would be great if we could make the final.